Scisnack | Should we suppress the fire? Should we suppress the fire? Forest fires have been around for as long as plants have been widespread and oxygen has been available to fuel their burning hunger. And so fires have become an integral part of many forest ecosystems. Unsurprisingly the earth has seen variations of fire activity in the past and it should follow in the future. What is news is our ability to influence fires: humans can both ignite a fire and quench it. But should we get involved? Or should we let a fire do it’s worst and rebuild on the ashes? It is by no means a trivial question; the US Forest Service spent 40% of its budget in 2014 directly combatting fires: more than 2 billion USD. Would fires have cost more in damages to infrastructures had they not been fought? Would this even have been a bad thing for the forest system? After all, fires emit nutrients that enrich the soil, they also clear overburdened areas; hence fires help new plants grow and more fire-resistant species strive. While this argument holds in principle, most fires nowadays are started by humans, either involuntarily, or voluntarily, for instance to clear land for agriculture. Unfortunately, human fires are akin to an invasive species; often the forest system they are introduced in is incapable of containing them effectively. As we have become a major influencer in igniting fires, it is only logical to balance this with an equally important fire extinguishing effort. In this snack I look at two instances of massive fires, Australia’s Black Saturday bushfires (2009) and Indonesia’s 1997-1998 Peat Fires. Both led to the deaths of 173 and 250 individuals respectively and affected the environment tremendously. While very different in their regime, both saw the disarray of fire-fighting authorities and highlighted the challenge of fighting such titans. 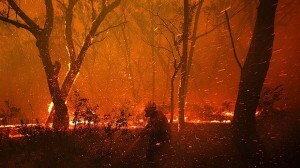 On the 7th of February 2009 a group of wildfires in South-Eastern Australia killed 173 and burned more than 450,000 ha. Flying embers during Australian fires lead to extremely fast spread. The Kilmore East fire alone burned 100,000 ha in less than 12 hours. It then merged with the Murrindindi fire and after 3 weeks these had accounted for 400,000 ha of burned area. Such high intensity short periods constitute what Australian authorities call “Catastrophic” fires. The severity of these fires is markedly linked to the local vegetation: Eucalypt forests contain trees with fibrous bark. This type of bark is easily ignited and can be carried faraway by winds, and lifted high into the air by the fire’s heat. Wherever the bark lands it potentially ignites a new fire. For more than a decade the area had seen significantly low rainfall and high temperatures. On that tragic day, these poor conditions were magnified by strong winds, which led to the rapid spread of fires to cataclysmic dimensions. An Indonesia peat fire, burning peat within the soil leads to extensive smoke emitted and proves very difficult to combat. The fire in Indonesia in 1997 reached similar proportions. It vented a tremendous amount of smoke and smog; seriously impacting nearby populations and dramatically scorched the land. In fact in September 1997, Indonesian president Suharto was forced to declare a state of emergency. Lightning and humans ignited the Australian and Indonesian fires although drought was an important factor in both situations. As for vegetation, akin to the Australian eucalypt, Indonesian peat soil was crucial to the 1997 fires. Indonesia is one of the few tropical localities possessing peat-lands; therein decaying vegetation is conserved and slowly buried. Although these are typically humid, peat had seen increasingly dry conditions due to weather but also human practices. The problem is, peat can burn, and when it does the soil itself goes in flame. This is virtually impossible to stop at large scales, as a fire can remain dormant and unnoticed for weeks. Both the Australian and Indonesian fires were strongly influenced by weather conditions, droughts in particular. These conditions increased the gravity of the fires, which were only stopped when more auspicious weather brought humidity. While these fires required different firefighting approaches, firefighters were incapable of directly confronting the beast and struggled to constrain the fire to manageable areas instead. Up to this point I have only hinted at the consequences of fire emissions. In principle, vegetation regrowth should compensate for the carbon dioxide emitted by the fire. Yet after land clearing fires, the vegetation rarely claims back the lost territory and the infamous gas increases in the atmosphere. So in the long term, fire management also influences global climate. Besides greenhouse gases, fires also emit aerosols (air-borne solid particles) and harmful gases. Both will affect air quality. 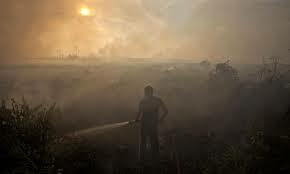 Thus forest fires also become major polluters who care little for borders: Malaysia and Singapore endeavoured to keep their people indoors during the foreign 1997 Indonesian fires. It remains difficult to attribute their effects on health as the regions deeply affected also generally suffer from anthropogenic pollution or have maintained modest medical records, but we expect that fires of this proportion severely damage health. 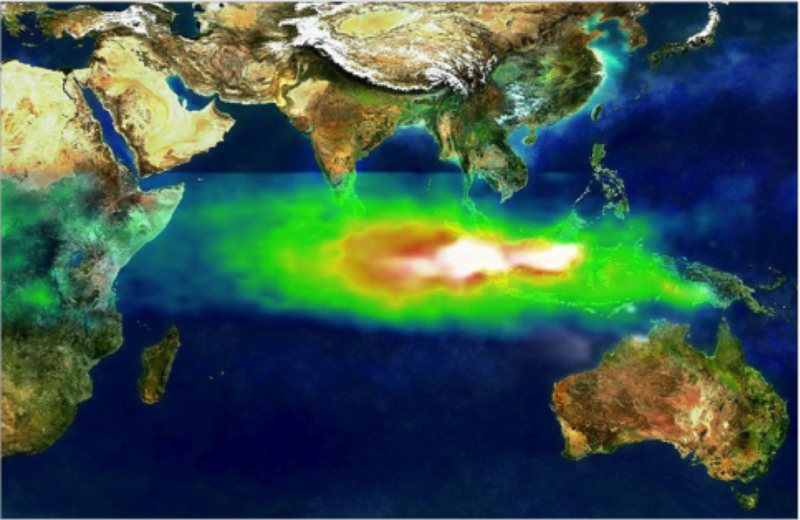 The pollution of the 1997 indonesian fires as seen by nasa’s toms detector. White shows smoke while red (high) and green (low) show the amount of smog over the indian ocean. SO, SHOULD WE FIGHT FIRES? We see the Australian and Indonesian fires had very different regimes. With so much diversity between fires our original question becomes challenging. Should we spend economic and human power to extinguish forest fires when they pose little apparent threat to human settlements? The main problem is that forest fires have both direct (burn) and indirect (air pollution) consequences for human settlements as well as the earth system in general. A warmer world or changing agricultural practices might also bring fires to previously fire-free forests. In the backdrop of a changing climate whether human forest fire suppression might be beneficial or damaging (both economically and to the ecosystem) remains uncertain. Yet as we are able to start fires, we need to extinguish them to protect our interest, as well as forest systems unable to cope with burning (e.g. rainforest or peat). As illustrated by the Australian and Indonesian fires, it is obvious that fighting fires of this magnitude is challenging; the fact is they were only extinguished when rain came. In reality firefighting efforts often constrain the fires to harmless areas until better weather allows a direct attack. Until then firefighters are forced to watch the blaze progress, as we do not yet have the power to extinguish an inferno until it has dimed. But fires can also be tamed in their infancy; hence fire prevention is the most efficient way to combat them and prevents the damages caused during peak burning. Prevention includes the avoidance of human ignitions as well as a prompt firefighting deployment and efficient fire monitoring (now using satellites). Yet as climate changes, so do forests and one proficient fire-fighting measure may later become precarious. Therefore firefighting forces around the world need to be flexible to changes in weather conditions. Finally, we need to consider the indirect effects of forest fires and their emissions (and effects on air quality), which should be recognized as a global issue and tackled as such. Pursuing a CASE PhD between the Met Office and Imperial College London, I am developing a parameterization to include fires within the Met Office's Unified Model. This intends to give a global climate model the capacity to interactively account for the influence of forest fires in past, present and future climates. Tagged Air quality, Australia, fire, firefighting, forest, Indonesia. 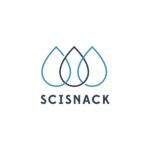 SciSnack Disclaimer: We write in SciSnack to improve our skills in the art of scientific communication. We therefore welcome comments concerning the clarity, focus, language, structure and flow of our articles. We only accept constructive feedback. All comments are manually approved and anything slightly nasty will not be accepted.